After winning their first match against Royal Challengers Bangalore by seven wickets, Chennai Super Kings are all set to take on Delhi Capitals which is scheduled to happen tomorrow in Delhi. Team CSK on their way to Delhi let down their hair and were seen poking fun at each other. MS Dhoni once again displayed his witty side and hilariously trolled his fellow teammate Kedar Jadhav while on the way to the capital. The video of the troll was shared on the official channel of the Yellow Army. Delhi Capitals vs Chennai Super Kings Live Cricket Score. Mohit Sharma was having a conversation with Kedar Jadhav about the first match, where the all-rounder remained unbeaten on 13 runs as the Yellow Army chased the total of 71. 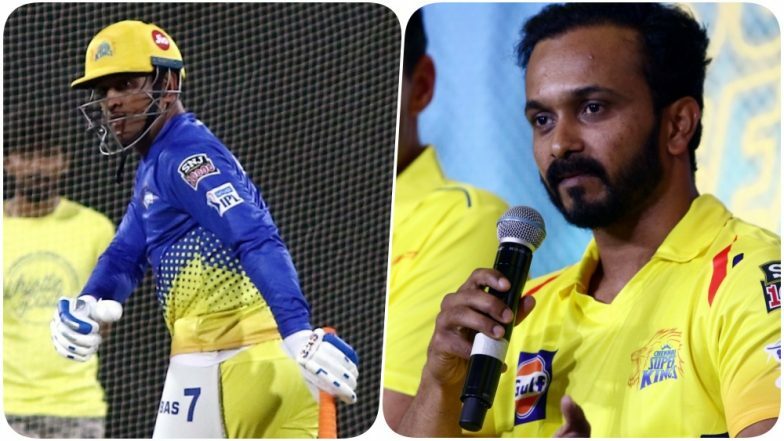 Kedar mentioned that there were similarities between the first match of IPL 2018 and the last game as he was there on the crease when CSK walked away with victories. DC vs CSK, IPL 2019 Match 5 Preview: New-Look Delhi Capitals Ready For Chennai Super Kings Challenge at Feroz Shah Kotla Stadium. The team will take on Delhi Capitals at the Ferozshah Kotla Stadium tomorrow. The Delhi Capitals won the opening game against the Mumbai Indians yesterday by 37 runs at the Wankhede Stadium in Mumbai.